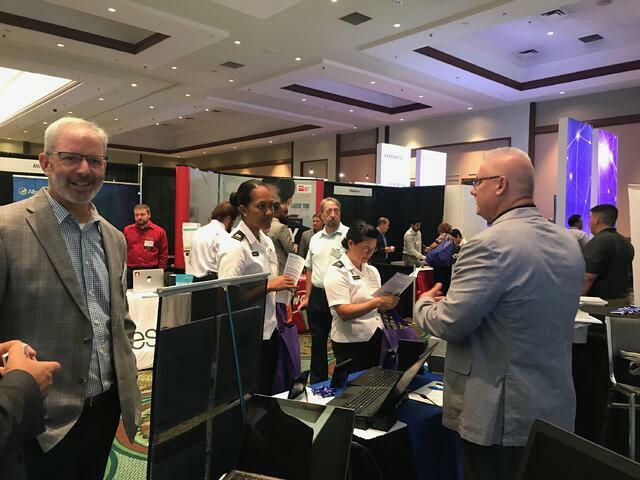 The NCS Booth at the Defense Health Information Technology Symposium (DHITS) was active all week and we were delighted to continue our many discussions with our service-related healthcare customers. Defense Health Agency (DHA) is a joint integrated Combat Support Agency that enables the Army, Navy, and Air Force medical services to provide a medically ready force and ready medical force to Combatant Commands in both peacetime and wartime. At the symposium NCS highlighted our solutions portfolio, including VDI, Getac rugged PCs and servers, a rugged medical tablet, medical carts, and rugged cabinets. The portable Cirrus DT WiFi is revolutionizing the virtual desktop experience in healthcare environments. DT WiFi delivers a secure, uncompromised PC experience where desktop computing is difficult, such as along corridors and at bedsides. In addition to its portability provided by WiFi, customers rave about its manageability, security, and cost effectiveness. DT WiFi shines when paired with roving medical carts. Older generations of virtual desktops are complex to administer, especially when tied to bridges for networking. The next generation Cirrus DT WiFi addresses these deficiencies. DT WiFi is easy to manage, roams effortlessly through corridors and uses three dipole antennas for superior reception. We are excited that Cirrus DT WiFi is a proven hit, especially when coupled with Workstation on Wheels. With exceptional network capabilities in aisles, down long corridors and in patient rooms, Cirrus DT WiFi is the virtual desktop of choice for cart connectivity and patient care productivity. We partner with Ergotron StyleView to deliver a solution that enhances workflow and caregiving. DHITS visitors were very impressed with the RX10H rugged medical tablet, provided by our close partner, Getac. The tablet delivers on every critical factor: from its antimicrobial surface and comfortable design to the 10.1" LumiBond display and built-in array of security and data tools. Together with the NCS portfolio of servers and zero client laptops, these solutions were the star of the show.